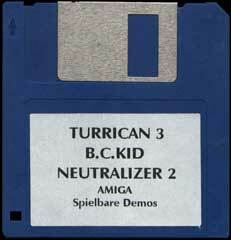 This is the original Factor 5 Demo-Disk of Turrican 3. It was sold for 5 DM at a computer-show in Cologne - and it contained 3 Demos. 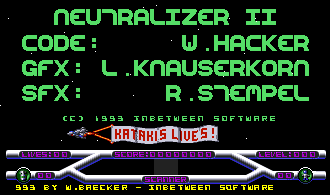 It uses ingame music and sound of Z-Out and is a little Defender-Clone. Nothing big, but made quite well. As everone knows (of course) the Z-Out sound was done by Rudolf Stember, but read the credits below ! So, I guess, Inbetween Software is just a gag from Factor 5.